Humanitarian crisis in West Papua as thousands displaced escaping bombing and suspected chemical weapons use by Indonesian military. The Indonesian military has since December, 2018 precipitated a humanitarian crisis in West Papua according to local reports. Over the past month, thousands of indigenous West Papuans have been displaced, fleeing air strikes and hiding in the highland jungle without food and water or access to health-care or shelter. According to local reports a mother and child have died, and three other children have died of starvation. The Indonesian military is suspected to have used the chemical weapon white phosphorus, banned under international law, in West Papua. According to reports at least four villages have been attacked from the air, from artillery, and by ground troops. 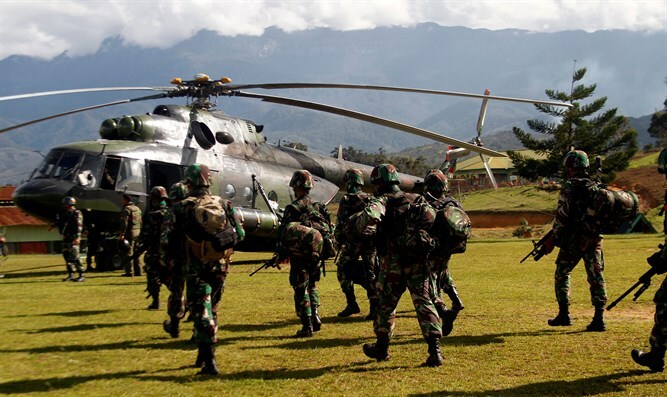 Major military and police operations have been launched by Indonesia in the Nduga Regency of West Papua. West Papuan representative groups are calling the situation a ‘humanitarian crisis’. According to the International Coalition for Papua, an alliance of over 15 human rights, church, and monitoring groups, at least 20 civilians have been killed in the operations so far. Ground troops have been sent into local villages with air support strafing civilian areas. According to eyewitness reports gathered by the United Liberation Movement for West Papua (ULMWP), the umbrella organization for mass Papuan independence groups, church and school activities in all 32 districts of the Nduga Regency have been completely shut down. Thousands of people displaced and hiding in the surrounding jungle. The ULMWP has called for an immediate cessation of Indonesian military and police operations and for the Indonesian government to allow humanitarian agencies and human rights monitors to enter the region. For decades the Indonesian government has operated tight restrictions on journalists and NGOs seeking to enter West Papua. In a statement released today ULMWP Chairman Benny Wenda said: "Indonesia is violating international law. The use of chemical burn-causing weapons is illegal. Indonesia flouts these treaties in its acts of extreme violence. When chemical weapons are used in Syria the world is horrified, but in West Papua the Indonesian government is able to cover up its crimes by stopping any independent organizations from entering the country and then launch brutal military operations afterwards. This episode is more evidence of the desperate need for West Papua to have freedom from the colonial occupation of the Indonesian state. "Without urgent action by international humanitarian, aid and human rights organisations, more Papuan civilians will be at risk. International observers and the West Papua people are lobbying for urgent access to West Papua to provide immediate medical treatment, food aid, medical support, documentation and resources to villagers; and to investigate the illegal use of chemical weapons," Wenda said.